The Ditch Witch was created to simplify the installation of underground, residential utilities. An American brand of ditching machine, Ditch Witch, is based in Perry, Oklahoma. 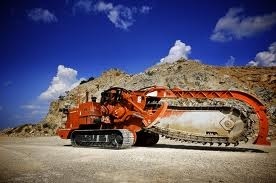 Ditch Witch is known for offering well designed underground construction equipment. The company has been around since 1949 although the first machine was introduced by company founder, Ed Malzahn, in the earlier 1940’s. It was a trenching machine that was created to replace the laborious pick-axe and shovel for digging pipe trenches. Ed Malzahn, the founder of Ditch Witch, was the son of Fredrick Malzahn who migrated from Germany. In 1902, Fredrick and his family moved to Perry, Oklahoma to get away from Minnesota’s harsh winters where he opened a blacksmith shop. An oil boom allowed the shop to prosper which later became a machine shop specializing in oil field repairs. Ed had learned much from his father including how a business can adapt to meet changing demands. He began applying his mechanical engineering degree to design a machine meant to simplify the installation of underground residential utilities in the mid 1940’s. Ed and his father created the prototype of the very first compact trencher in the family machine shop. This ditching machine took several months to create and became known as the DWP, or Ditch Witch Power. Made commercially available in 1949, the DWP was the first compact mechanical trencher used to lay water lines underground. It marked a point in history where a long-time problem that plagued utility contractors had finally been solved. The quickly growing popularity of the DWP trencher caused the family machine shop, known then as Charlie’s Machine shop, was transformed into Charlie’s Machine Works Inc. This shop became the headquarters for the current company, which remains unmoved from its original home in Perry, Oklahoma. Trenchers were just the beginning of what this company had to offer. They quickly diversified their product line to offer various digging and underground construction machinery including earth drills, excavating machines, skid steers and more. All machines, to this date, bear the Ditch Witch name. The DWP compact trencher was named one of the 100 best American made products in the world twice by Fortune Magazine. In 2002, the Society of Mechanical Engineers designated the Ditch Witch Power machine as a mechanical engineering historical landmark. Most commonly known as Ditch Witch, the company operates under the name, The Charles Machine Works, Inc. Ed Malzahn is still the president and chairman if the board and his granddaughter, Tiffany Sewell-Howard, serves as the CEO, a position she has held since 2005. The firm’s manufacturing plant has expanded to cover 30 acres and includes research, testing, training, and production facilities. They currently have grown to offer ditching machines worldwide and employ more and 1,300 people at their headquarters alone.